Crescent Trips is the world’s first iPhone/iPad in-flight prayer time and direction calculator for Muslim travelers. It has quickly become one of the top travel apps in the Middle East. SINGAPORE, November 20, 2013, Crescentrating, the leading authority on Halal Travel, has announced the long awaited launch of the Arabic and English version of Crescent Trips. The app already made history by being the world’s first iPhone/iPad Mobile App that provides in-flight prayer times and direction. It will be made available for the Android Platform within the next few months. The first version of the App was launched in August this year. Since its launch, it has been downloaded by users in more than 90 countries Currently the top 10 countries with the most downloads are from USA, Saudi Arabia, France, Kuwait, UAE, UK, Singapore, Egypt, Malaysia and Pakistan. The latest version now allows users to select either an English or Arabic language interface. Fazal Bahardeen, CEO Crescentrating, said “With more than 35% of downloads coming from Arab countries, we decided that this was the next most important feature to enable a better user experience.” Apart from the addition of the Arabic language interface, the new version also has an improved user interface. Crescent Trips App allows Muslim travelers the ability to calculate the prayer times and prayer direction along the flight path of their journey based on the departure airport/time and arrival airport/time. 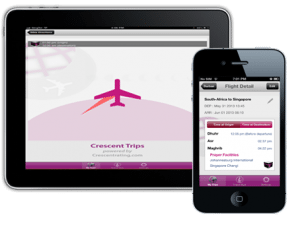 Users can also use the Crescent Trips App as a travel planner and organize their trips and flights according to the destination and access the prayer times and prayer direction in offline mode while in the air. Also featured is a collection of Islamic travel duas in Arabic text and audio playback along with its English translation.